Graduate research looked at how AR can enhance the decision-making process for Dutch female shoppers online. Technology and how we engage with the digital world is becoming a popular research topic with international students from Wittenborg University of Applied Sciences doing their final graduation assignment – from robotics to social media. The latest is from Guyanese student, Rousanna Baird, who wrote her thesis on the use of Augmented Reality (AR) in the retail business – particularly as a personalisation tool for women’s fashion retail in the Netherlands. AR is technology that superimposes virtual components on a user’s view of the real world – not to be confused with Virtual Reality (VR) or Immersive Technology (XR), which provides a full 3D experience for users. To give an example, IKEA has been one of the early adopters of AR with their IKEA Place app, which lets its customers see how a piece of furniture will look in their house by using their phone camera. Rousanna’s research looked at whether AR can enhance the decision-making process for Dutch female consumers who shop online. “With emerging technology such as AR, marketers and fashion retailers should rethink their business models and implement strategic tools that can boost not only sales but also provide satisfaction for their customers,” Rousanna writes in her thesis. “From the primary research, it is evident that AR is a tool that could be accepted as a strategic personalisation tool. About 78% of the survey participants and 86% of the interview participants indicated that would like to have a personalised avatar with their body measurements. There was also an enormous response to having a virtual fitting room as an alternative solution to dressing rooms and an avatar created with the measurements of consumers’ body types. Rousanna graduated and received her diploma at Wittenborg’s 2018 Summer Graduation Ceremony last Friday. 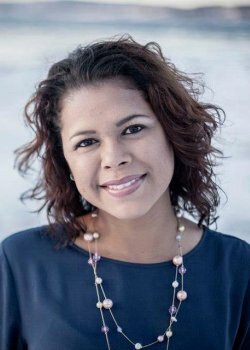 Back in Guyana she ran her own retail business before joining Wittenborg to do an IBA in Marketing & Communication. She also has some recommendations for future research on the topic. “Not many people understood or knew what AR was or is. While collecting the primary data through an online survey, there was considerable interest in the subject by male participants, a demographic my research excluded.